Wood rots due to the presence of enough moisture for fungi to use the wood as food. The fungi damaged areas extend well beyond the clearly visible rotten wood. Any rotted wood repair that is to last has to treat the wood that has started to rot, but is not obviously damaged, in addition to the wood that has obviously started to rot. 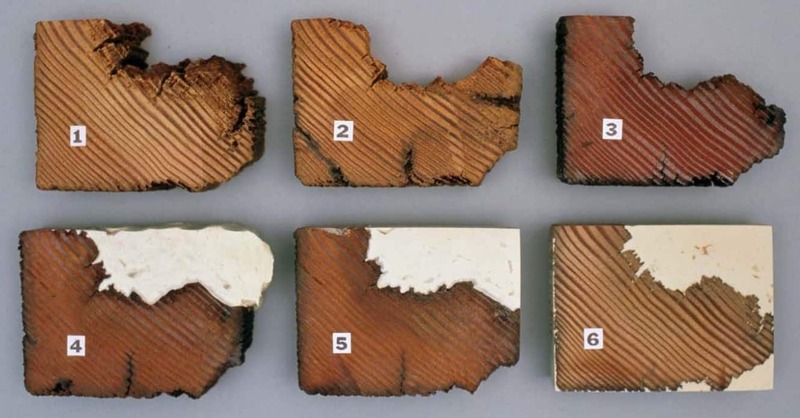 What does rot in wood really look like? The image below shows two adjacent 20mm thick sections cut from a rotten glulam beam(a beam made of sections of timber glued together). These are commonly used as structural timbers, and are available in very long lengths. The section on the left clearly shows the rot, areas that have been attacked by the fungi. What it does not show is areas where the fungi have attacked the wood but have not damaged the wood to the point where it is visible to the naked eye. The section on the right has been treated with Smiths Clear Penetrating Epoxy Sealer (CPES) which has been dyed blue. The dark patches on that image clearly show areas of abnormal porosity. These areas of abnormal porosity (well the vast majority of them anyway) can only be attributed to the fungi that have caused the visible damage. There is no point in performing any rotted wood repair until all of the areas of abnormal porosity, where fungi are clearly active and have already damaged the wood, have been repaired. The section pictured on the right was placed in a shallow tray and the blue-dyed CPES wicked up into the wood. In only a few minutes, in regions where the fungi had eaten the wood, the dyed wood was now visible. 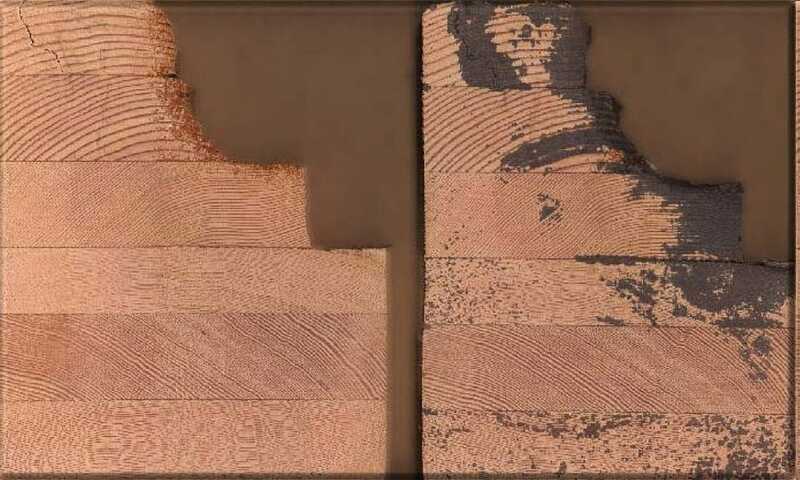 CPES is an Impregnating Resin that impregnates deteriorated wood much more than sound wood, because the deteriorated wood has more porosity, because the rot-fungi ate into it along the length of the individual wood fibres. These regions are now impregnated with a highly rot-resistant and water-repellent resin. Furthermore useful mechanical properties are restored – fillers will stay stuck and the rotted timber will now carry fasteners. 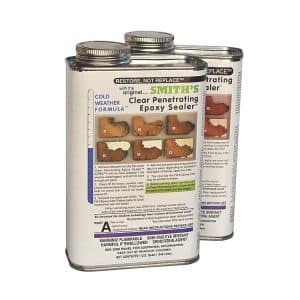 This treatment improves the ability of the wood to resist further deterioration. This is the first step in the restoration process. When finally painted, the impregnating resin glues the paint to the wood, so it sticks better and lasts longer. Rotted Wood Repair – How do I do it? 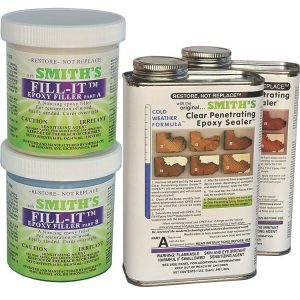 We sell kits containing the two products required to perform the permanent waterproof repairs detailed above. 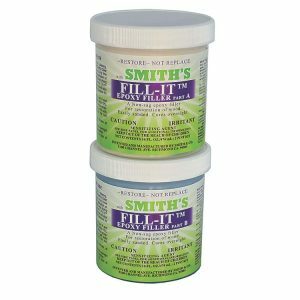 The kits are sold at a discounted price, and the individual products may be purchased separately if required. Further information regarding rot degradation of timber may be found at www.woodrestoration.com.